A little-known fact is that a great deal of work goes into maintaining the rich collection of books we have here in the Brandeis Library. Library books receive a high level of use and as such are subject to wear and tear, such as torn spines, loose bindings and paper damage. They also suffer from careless handling including highlighter markings, sticky notes, paper clips, folded pages, coffee and food spills, etc. Brandeis’s Preservation Department repairs hundreds of books every year. It is helmed by Leslie Reicher, Preservation Officer, who introduced the program to the library system in 1983. 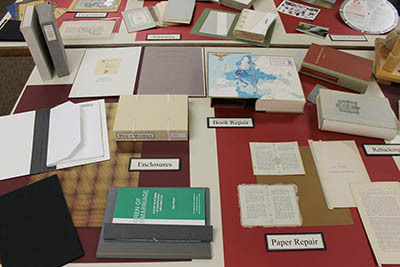 Preservation staff perform more than 20 conservation treatment procedures for general collections, ranging from the simple to the complex, including paper repair, sewing of text, and rebinding. Archives and Special Collections materials are preserved through various rehousing methods created individually for each piece. 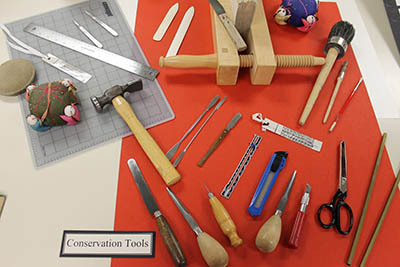 Learn more about preservation at the Library of Congress. Leslie Reicher applies various techniques to reverse or prevent damage to the Library’s book collection. Check out some of the tools and treatments she uses!